The Most Excellent Order of the British Empire is an order of chivalry, established in June 1917 by King George V. It includes five classes in civil and military divisions (GBE/GBE, KBE/DBE, CBE, OBE, MBE). Just last week, Her Majesty’s Birthday Honours were announced, including recognition for Professor Brian Cox and actress Catherine Zeta Jones. Reading through the list, I was struck by just how tiny a percentage are what you might call ‘well known’. The vast majority are so-called ‘ordinary, hard working people’ from a wide range of backgrounds and walks of life. Why don’t we create a Private MBE’s Club for Great Britain? Why not seize the opportunity to offer the recipients of honours with an invitation. An invitation to join a network of people, all over the country, who have an interest in making a difference. Yes, it’s important to recognise achievement and there should be a ceremony and gathering. But what happens next? The Private MBE’s club would allow people from all over the country to connect with each other at a range of gatherings (both events and online). Just imagine you had just been honoured. Rather than returning to your community, what if you had the chance to join forces, even a few times a year, with others from around the UK? This could be an amazing resource for the nation. Perhaps the network could be asked questions. Perhaps it could be mobilised at certain times of the year, or in times of national need. Maybe through partnership with existing organisations, it could be given somewhere to live or meet? What if you can’t think of anything worse? What if you are humbled and more than a little embarrassed by your honour? That’s fine. You could decline the chance to join the Private MBE’s Club. If we have a system in place for spotting and recognising people who have served their country, why waste the opportunity to connect them with each other, knowing that they could be greater than the sum of their parts? Great idea mate – really like it! Sounds like a plan. Particularly if the Club is focused on what the honours recipients could do together to help less advantaged people. That is a really positive idea. As honoured citizens people become seen as leaders in their respective fields, i think something like this will help to empower and inspire others particulary those less advantaged than others, to become leaders in their own way. Great idea. An MBE should be the start of something, not the end. 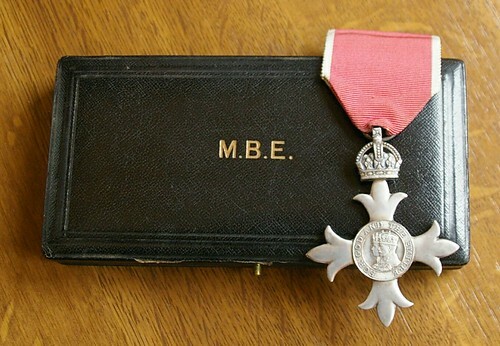 MBE’s (I think) tend to be given earlier in people’s lives, so they’d be accessible role models and it’d be good to link it to schools. Maybe an expectation that they give a talk once a year in a school would be a start. Maybe rebooting MBE’s would be a good thing for one of the Princes to get involved with (a 21st century DofE award).